Lower right: "Renoir. / Wargemont. 9.S.bre - 81." Pierre-Auguste Renoir depicted the self-assured composer Albert Cahen d'Anvers, a former pupil of César Franck, nonchalantly smoking a cigarette at a friend's home. Traditionally, portraits of men were somber, but Renoir combined decorativeness with fidelity to his sitter's appearance. 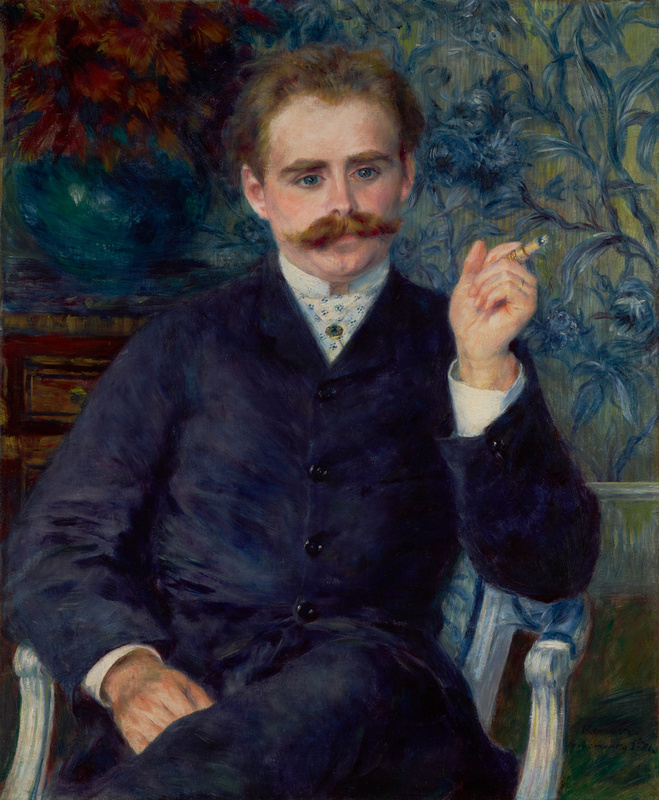 Facial hair was regarded as a powerful indicator of male sexuality, and Renoir shows Cahen d'Anvers's curled mustache echoing the wallpaper's curves, his ruffled red hair referring to the potted plant's feathery leaves. Cahen d'Anvers's authority and status are suggested through his alert, commanding gaze and details such as his elaborate cigarette holder and cravat. Renoir hoped that success in portraiture would lead to success in the wider potential market attracted by the Salon. Twenty years into his career, he had become so disenchanted with Impressionism that he called the movement a "blind alley." He modified his style, combining the loose, painterly effects of early works such as La Promenadewith Renaissance painting's firm contours and weighty forms. He began receiving portrait commissions, often from wealthy Jewish patrons. Only a year after making this portrait, however, his uncertainty about achieving his aims through portraiture and his increasing anti-Semitism meant that portraiture no longer appeared so promising to him. Albert Cahen d'Anvers, 1846 - 1903, commissioned from the artist, 1881; probably by inheritance to his nephew, Hubert Cahen d'Anvers, 1903. Source: JPGM Paintings Department, curatorial files, communication from Galerie Beyeler (November 24, 1988). Private Collection (Switzerland), sold through Galerie Beyeler to the J. Paul Getty Museum, 1988. Schneider, Marcel. "Lettres de Renoir sur l'Italie." L'Age d'or, no. 1 (October 1945), pp. 98-99. Renoir, Jean. Renoir, My Father. Randolph Weaver and Dorothy Weaver, trans. (London: Collins, 1962), p. 229. Daulte, François. Auguste Renoir: Catalogue raisonné de l'oeuvre peint. Vol. 1, Figures, 1860-1890 (Lausanne: Éditions Durand-Ruel, 1971), unpaginated, no. 362, ill.
Renoir: Rétrospective Pierre-August Renoir, exh. cat. (Tokyo: Seibu Galleries, 1971), unpaginated, no. 14, ill.
Fezzi, Elda. L'Opera completa di Renoir nel periodo impressionista, 1869-1883 (Milan: Rizzoli, 1972), pp. 109-10, no. 478, ill.
White, Barbara Ehrlich. Renoir: His Life, Art, and Letters (New York: Harry N. Abrams, 1984), pp. 108, 117, ill.
Distel, Anne. "Charles Deudon (1832-1914): Collectionneur." Revue de l'art, no. 86 (1989), p. 61n20. "Acquisitions/1988." The J. Paul Getty Museum Journal 17 (1989), pp. 124-25, no. 33, ill., cover ill.
Monneret, Sophie. Renoir (Paris: Chêne, 1989), p. 153, no. 20, ill.
Anda-Bührle, Hortense, Magrit Hahnloser-Ingold, and Charles S. Moffett, eds. The Passionate Eye: Impressionist and Other Master Paintings from the Collection of Emil G. Bührle, Zurich, exh. cat. (Zurich: Artemis, 1990), unpaginated, under no. 52, entry by Charles S. Moffett. House, John, et al., eds. Renoir: Master Impressionist, exh. cat. (Sydney: Art Exhibitions Australia Limited, 1994), pp. 28, 86-87, no. 18, ill., entry by John House. Adler, Kathleen. "Renoir's 'Portrait of Albert Cahen d'Anvers.'" The J. Paul Getty Museum Journal 23 (1995), pp. 31-40, fig. 1. Bailey, Colin B. Review of Renoir: Master Impressionist. Brisbane, Melbourne, Sydney. Burlington Magazine 137, no. 1105 (April 1995), p. 277, fig. 84. Jaffé, David. Summary Catalogue of European Paintings in the J. Paul Getty Museum (Los Angeles: J. Paul Getty Museum, 1997), p. 105, ill.
Fredericksen, Burton B., et al. Masterpieces of the J. Paul Getty Museum: Paintings (Los Angeles: J. Paul Getty Museum, 1997), p. 106, no. 57, ill., entry by Denise Allen. Bailey, Colin B. "Portrait of the Artist as a Portrait Painter." In Renoir's Portraits: Impressions of an Age, exh. cat. Colin B. Bailey et al., eds. (Ottawa: National Gallery of Canada, with Yale University Press, 1997), pp. 16, 38. Bailey, Colin B., et al., eds. Renoir's Portraits: Impressions of an Age, exh. cat. (Ottawa: National Gallery of Canada, with Yale University Press, 1997), pp. 178-80, 305-6, no. 37, ill.
"Faces of Impressionism: Portraits from American Collections." Museum News 78, no. 6 (November-December 1999), p. 15, ill.
Johnston, Sona, et al., eds. Faces of Impressionism: Portraits from American Collections, exh. cat. (Baltimore: Baltimore Museum of Art, with Rizzoli, 1999), pp. 154-55, no. 58, ill.
House, John. "Impressionism and the Modern Portrait." In Faces of Impressionism: Portraits from American Collections, exh. cat. Sona Johnston et al., eds. (Baltimore: Baltimore Museum of Art, with Rizzoli, 1999), p. 12. "Calendar." Burlington Magazine 142, no. 1166 (May 2000), p. 334, fig. 71. Nord, Philip. Impressionists and Politics: Art and Democracy in the Nineteenth Century (London and New York: Routledge, 2000), p. 60. The J. Paul Getty Museum Handbook of the Collections. 6th ed. (Los Angeles: J. Paul Getty Museum, 2001), p. 137, ill.
Néret, Gilles. Renoir: Painter of Happiness, 1841-1919 (Cologne: Taschen, 2001), p. 204, ill.
Allen, Denise, et al. Masterpieces of Painting in the J. Paul Getty Museum. Rev. ed. (Los Angeles: J. Paul Getty Museum, with Thames & Hudson, 2003), p. 102, no. 54, ill., entry by Denise Allen. Hiesinger, Ulrich W., ed. Antonio Mancini: Nineteenth-Century Italian Master, exh. cat. (Philadelphia: Philadelphia Museum of Art, 2007), p. 7, fig. 3. Dauberville, Guy-Patrice, and Michel Dauberville. Renoir: Catalogue raisonné des tableaux, pastels, dessins et aquarelles. Vol. 1, 1858-1881 (Paris: Éditions Bernheim-Jeune, 2007), p. 540, no. 558, ill.
Rathbone, Eliza E., ed. Renoir and Friends: Luncheon of the Boating Party, exh. cat. (Washington, D. C.: Phillips Collection, with D. Giles Limited, 2017), pp. 18, 19, 57, 134, no. 3, ill.
Rathbone, Eliza E. "Renoir's 'Luncheon of the Boating Party': 'Le dernier grand tableau." In Renoir and Friends: Luncheon of the Boating Party, exh. cat. Eliza E. Rathbone, ed. (Washington, D. C.: Phillips Collection, with D. Giles Limited, 2017), pp. 18, 19, ill.
Patry, Sylvie. "Aline Charigot: Model, Wife, and Muse." In Renoir and Friends: Luncheon of the Boating Party, exh. cat. Eliza E. Rathbone, ed. (Washington, D. C.: Phillips Collection, with D. Giles Limited, 2017), p. 57.